The Bengal breed originated as a cross between the Asian Leopard cat (Prionailurus Bengalensis) and a Domestic cat. The first three generations of a domestic bengal X Leopard cat are called foundations (F1, F2, and F3). 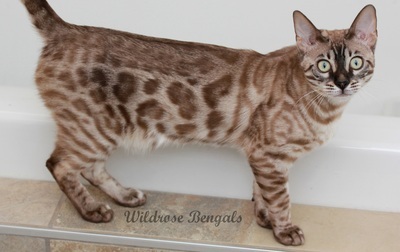 The fourth generation and any beyond that are called Bengals (also refered to as SBT). 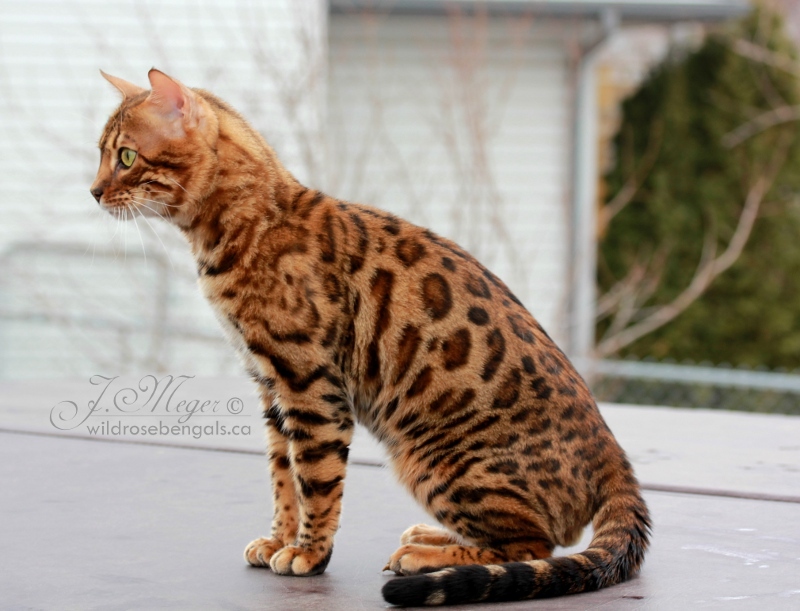 The Bengal cat is a domestic cat, yet has retained some of its wild characteristics. 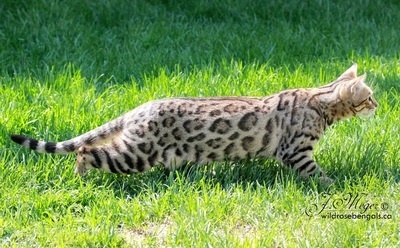 They are very athletic and enjoy climbing to high places. 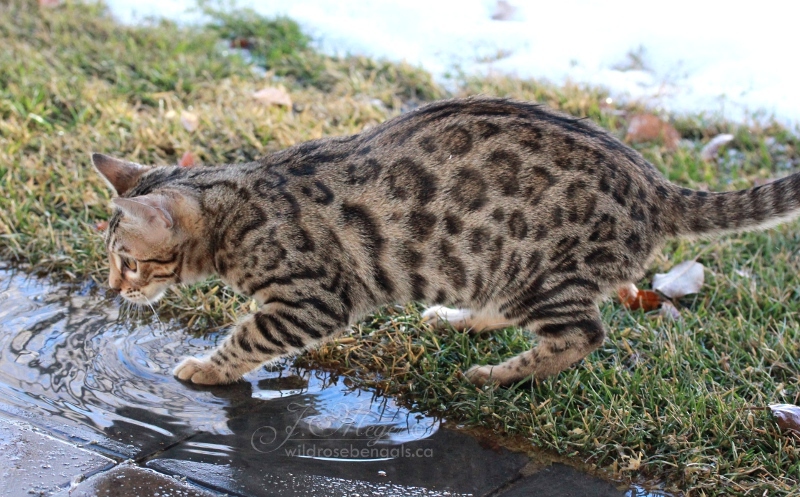 Bengals also have a fascination with water and will take any opportunity to play in it. 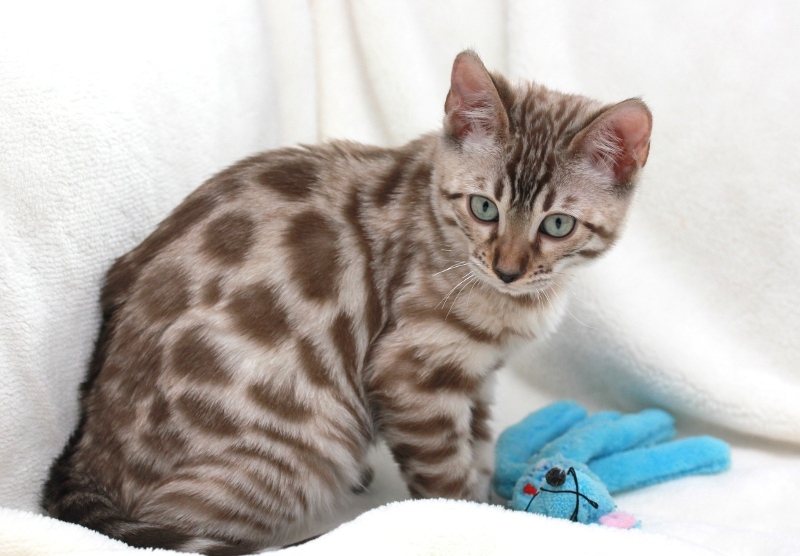 The Bengal cat has a very soft short to medium coat that is slightly longer in kittens. 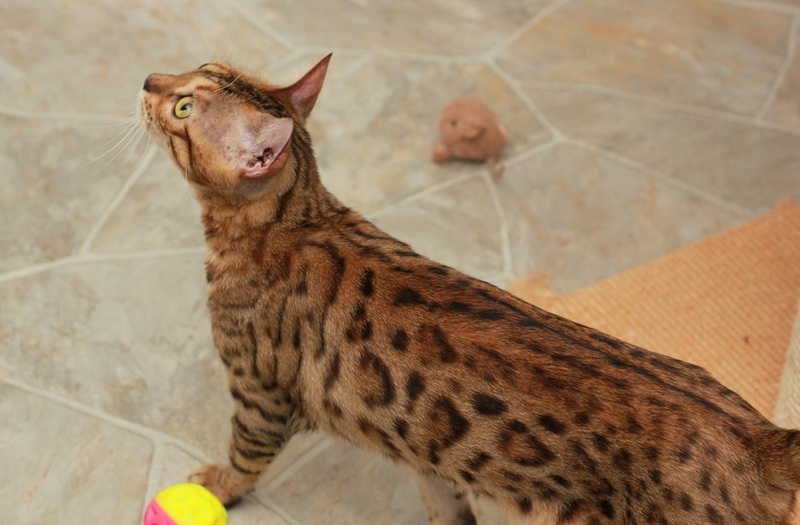 It is thick and luxurious and comes in various colors and patterns such as rosettes, spots and marbles. 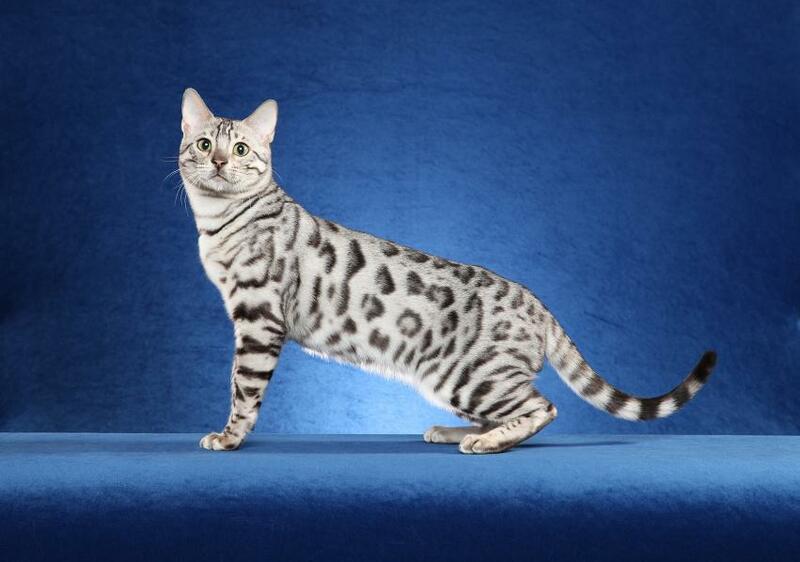 Some have glittered coats (as if gold dust were sprinkled over them) which is a very desirable quality. 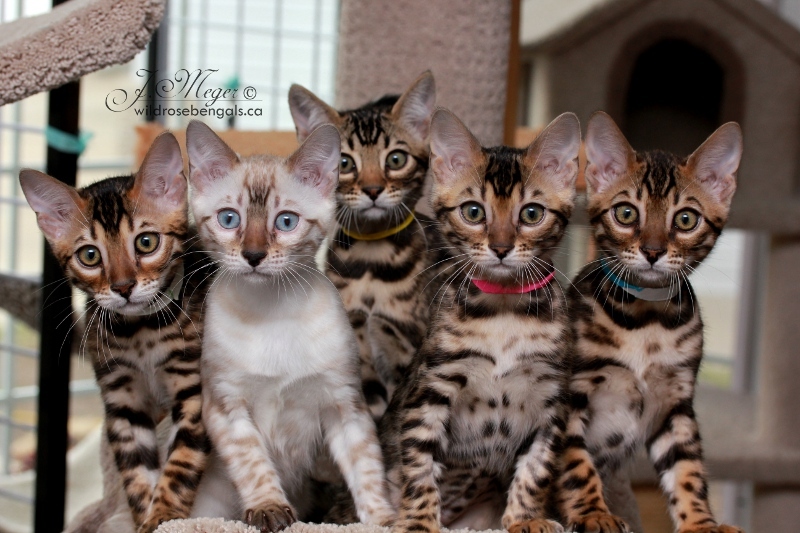 They have large alert eyes and they are very curious. 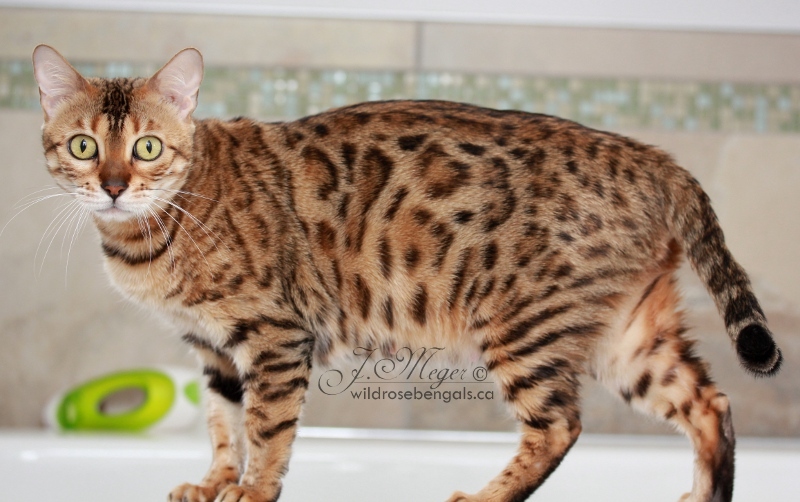 The Bengal cat makes a great family pet. 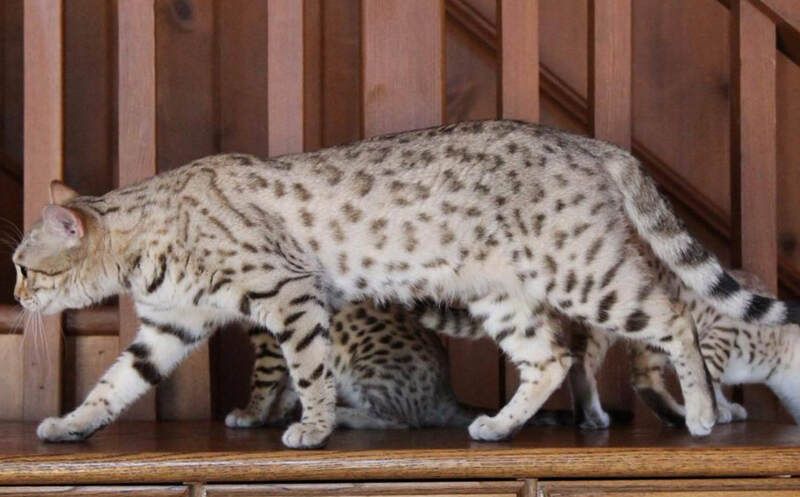 They get along great with their family as well with the family dog. 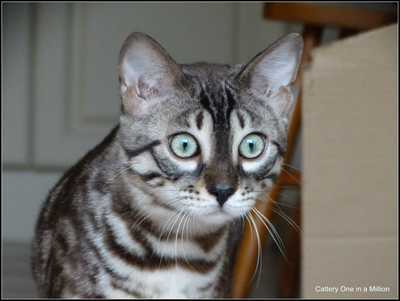 One of the biggest concerns is heart disease (HCM). 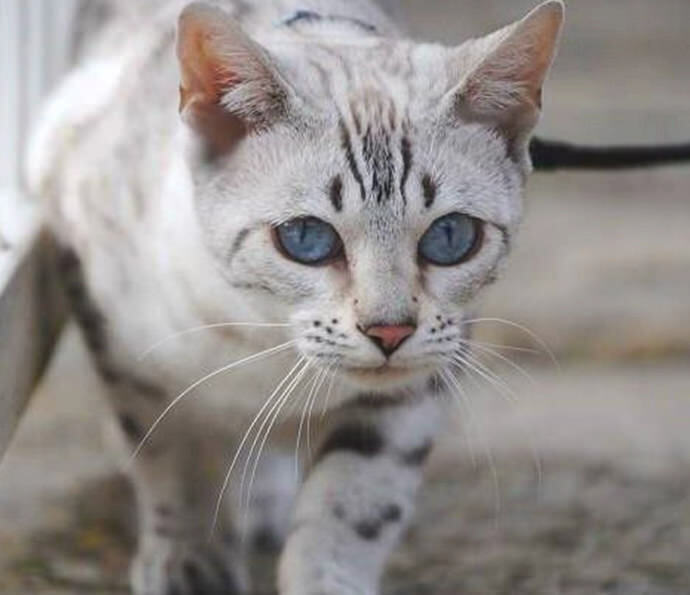 Unfortunately in most cases it results in an early death, however if caught soon enough, with daily medication it can result in a long full life for your cat. 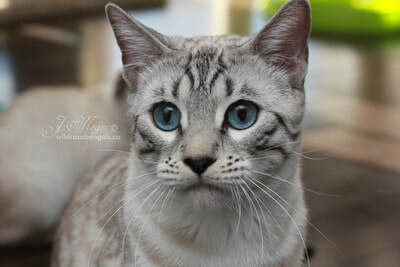 We do screen our breeding cats every one or two years, however this does not mean that it is impossible for their offspring to get this horrible illness. 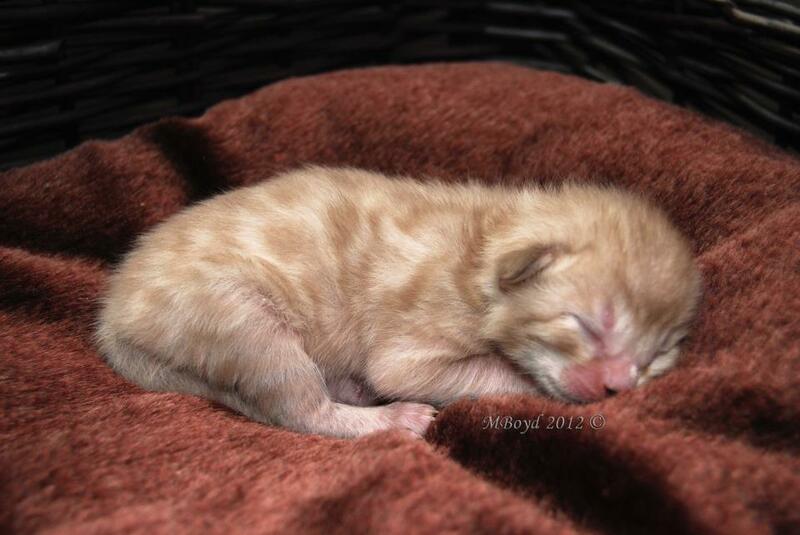 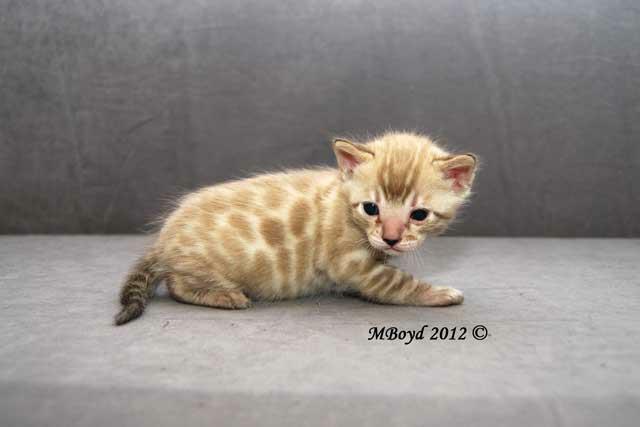 Two HCM negative parents can occasionally produce an HCM positive kitten. 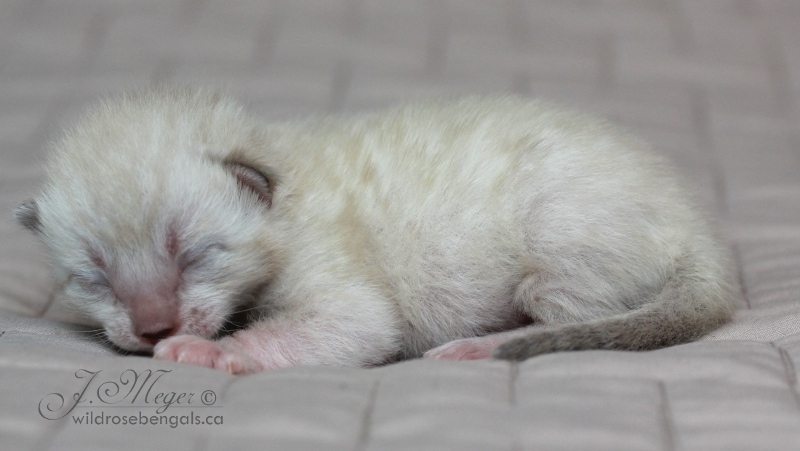 HCM is something that can show up many years down the road, or it can happen early on in life. 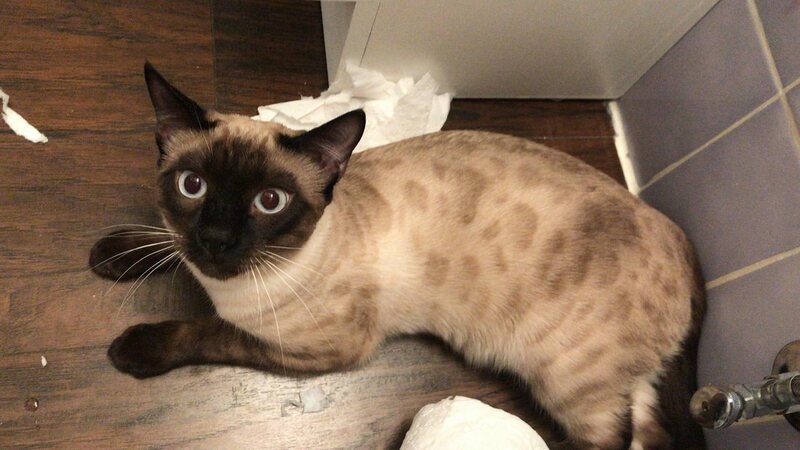 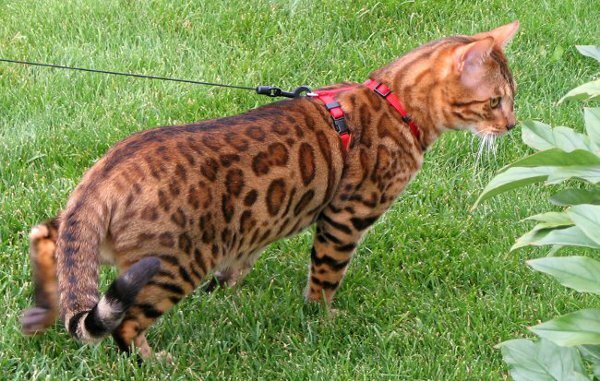 Since Bengals are a fairly new breed they haven't been able to develop a blood test to see if they will get HCM as they have with some other breeds. So scanning often is all that we can do to lessen the numbers of positive cats we produce. Other health issues are PK Deficiency (a type of anemia), and PRA (Progressive Retinal Atrophy) which can cause early blindness. 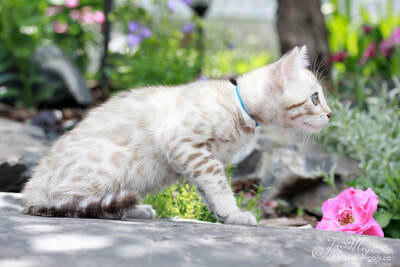 Our cats are all tested for both of these health problems and cannot produce kittens that are positive for these diseases. We may have the occasional female that is a carrier of one disease (N/K), however we always ensure that all of our studs are negative so that they cannot produce kittens with the disease. 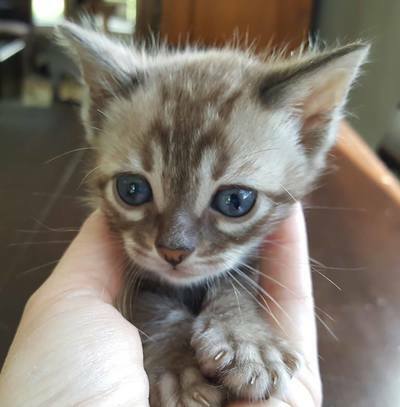 Being a carrier does not affect the kittens health in any way. 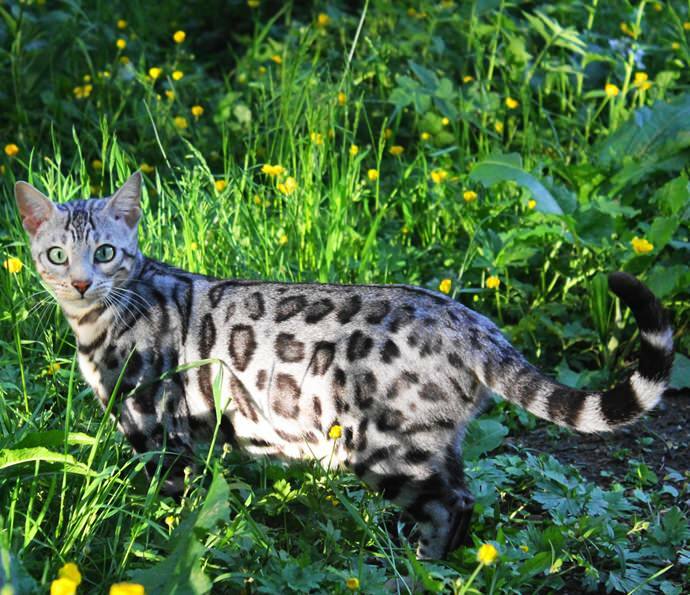 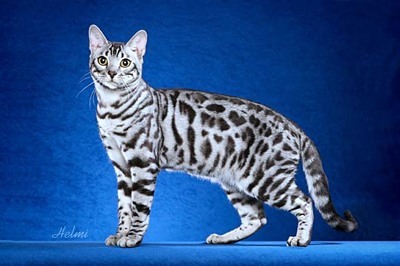 The spotted variety of the Bengal can take on many differences in patterns. 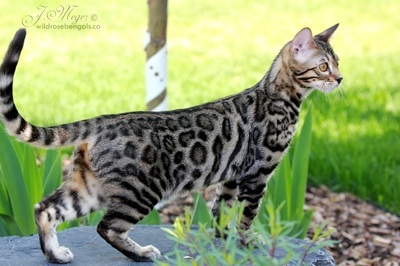 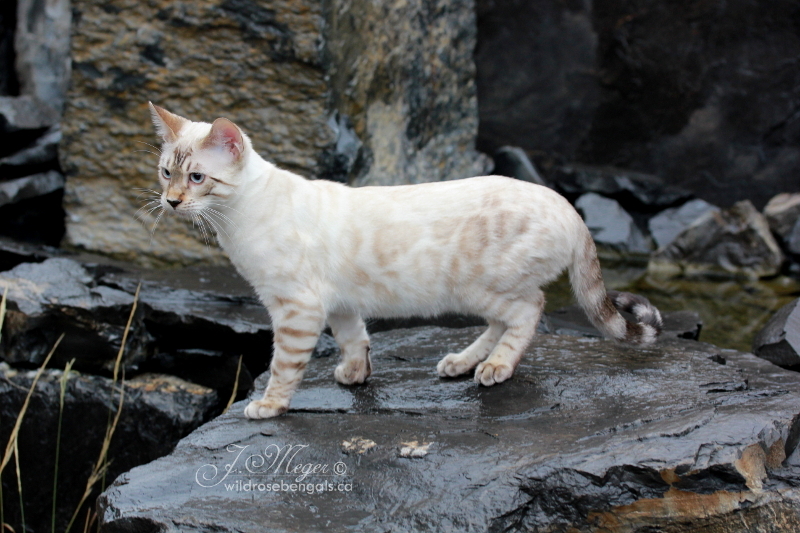 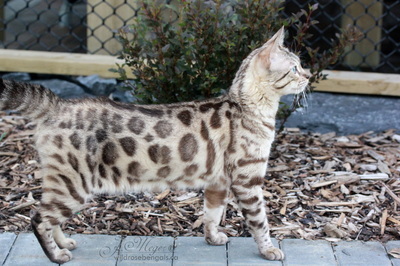 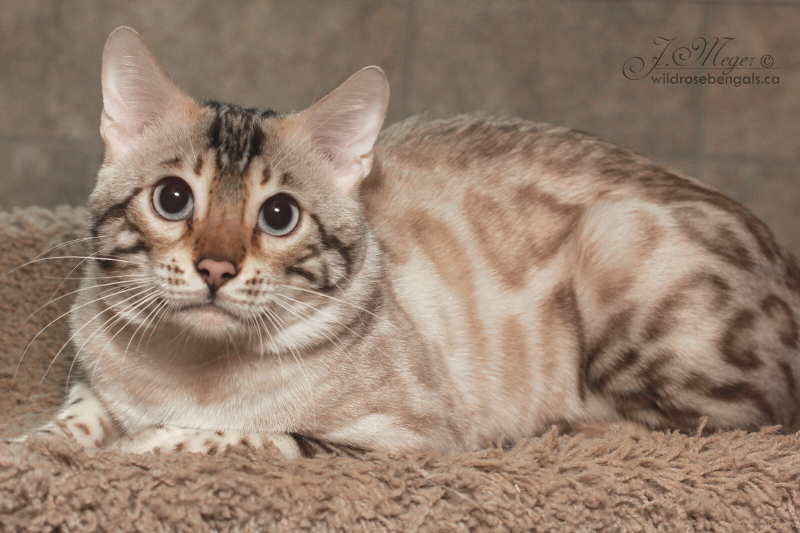 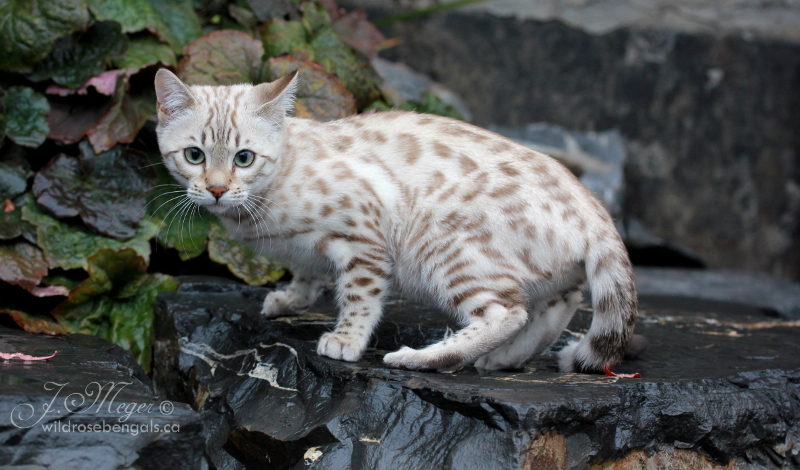 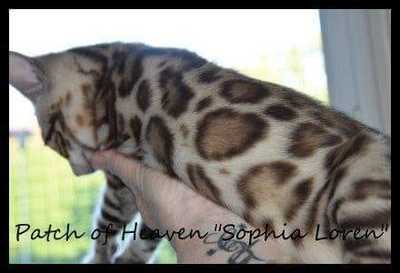 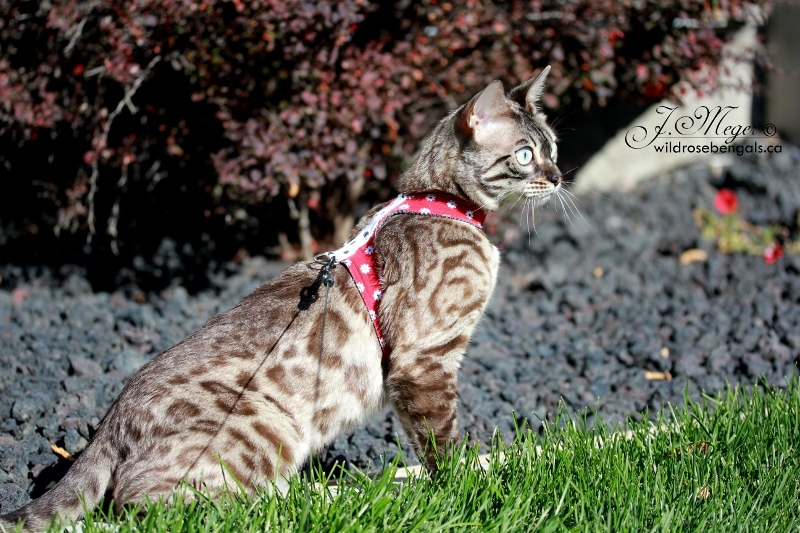 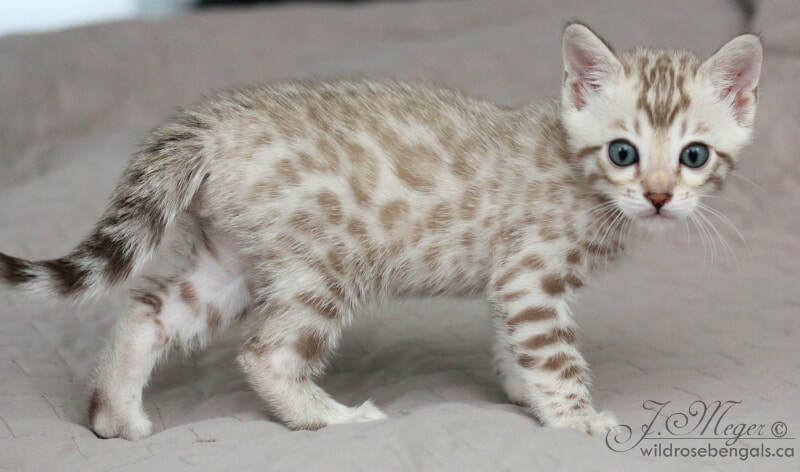 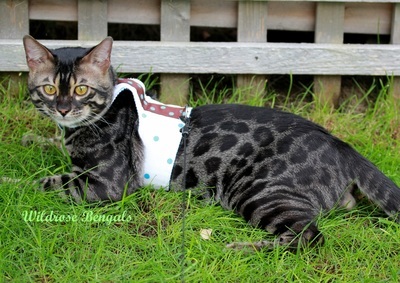 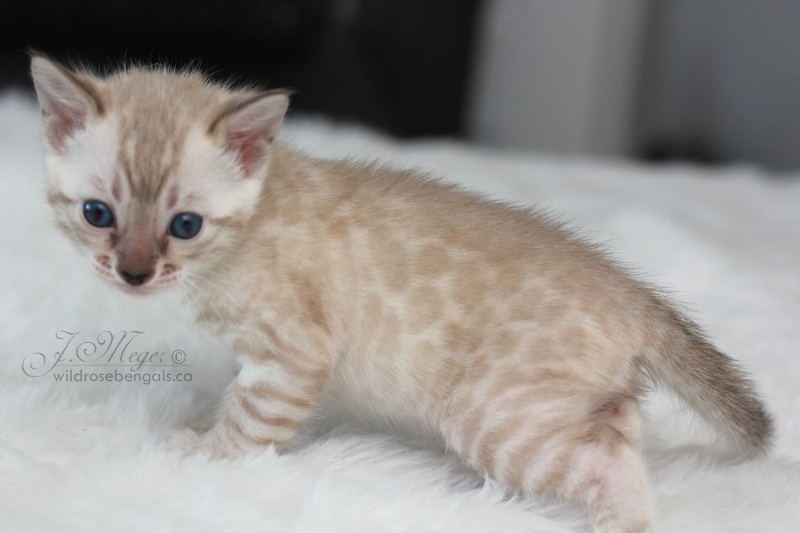 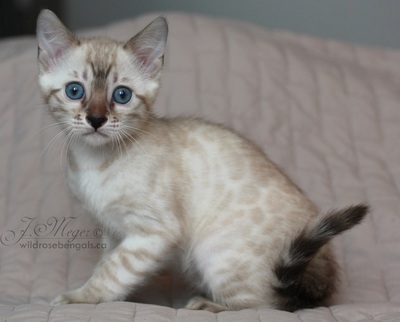 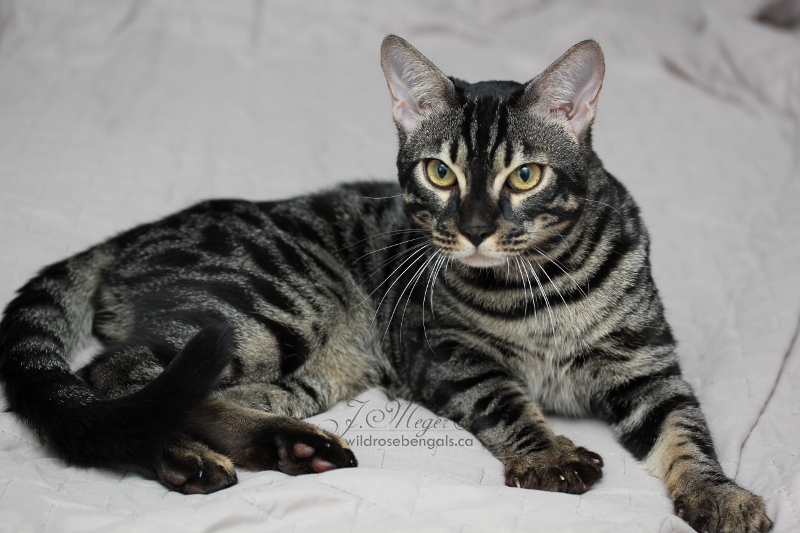 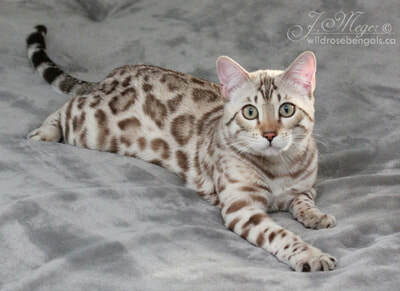 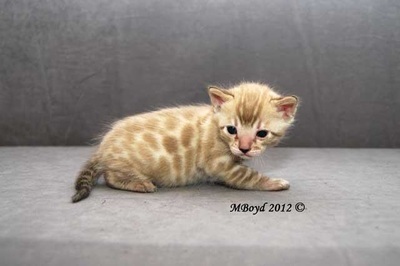 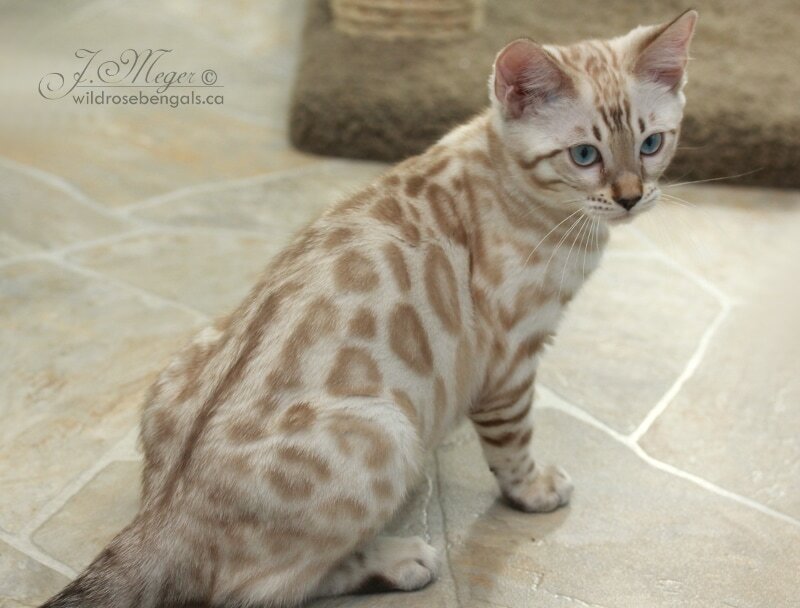 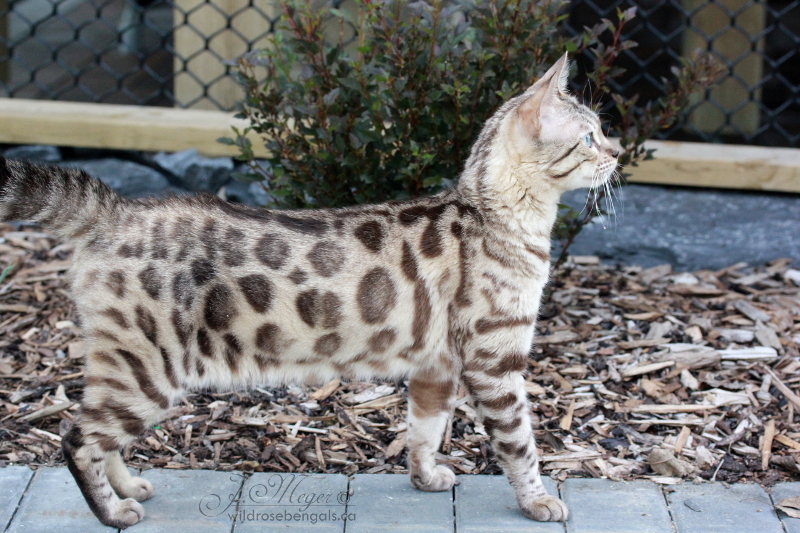 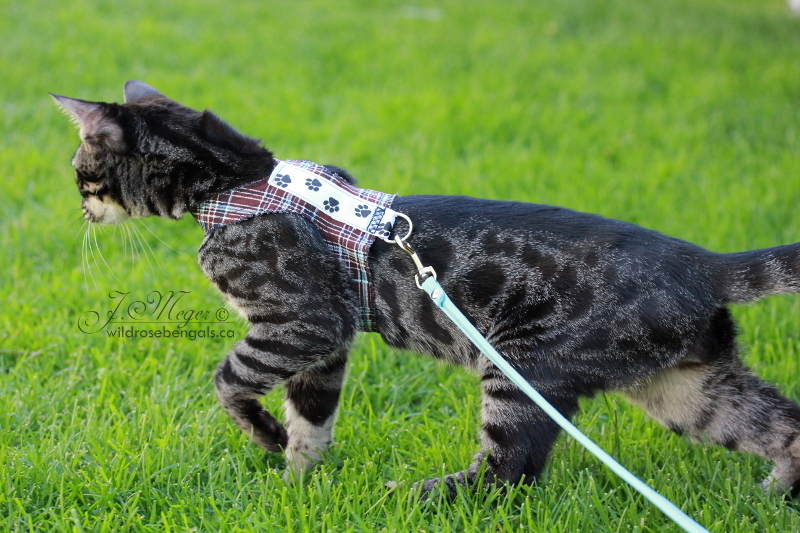 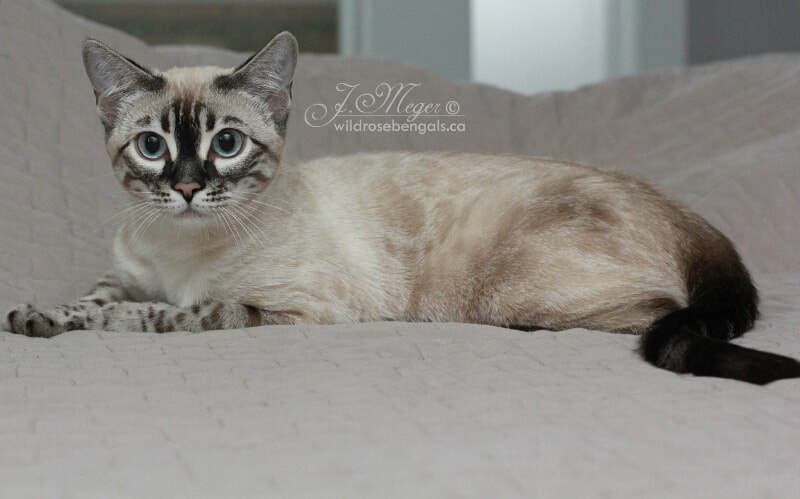 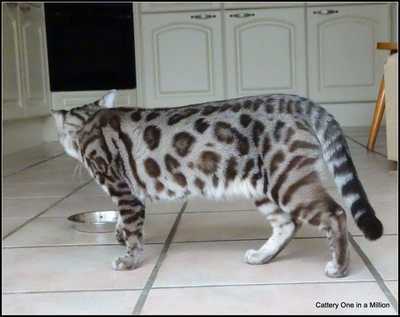 A spotted Bengal can have a solid spot of one color, or we can have a rosetted Bengal. 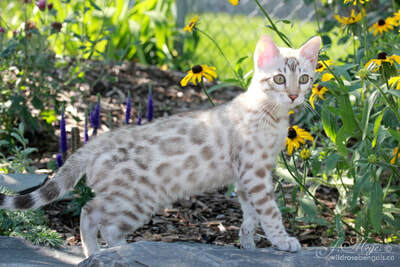 A rosetted Bengal is still spotted, but the spots have two colors to them. 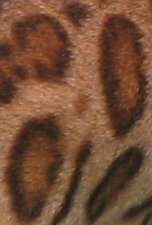 Usually there is a dark spot of either brown or black, and then a kind of rust or orange shading inside or around the spot, creating a rosette like you would see on a wild cat like a jaguar. The photos below are all of brown Bengals, but you can have the same markings on any color of Bengal. Arrowhead rosette markings should be triangular in shape pointing toward the back of the body with the base of the rosette fading into the background. Turk has many arrowhead rosettes with a few solid spots and even a couple small donut rosettes mixed in. 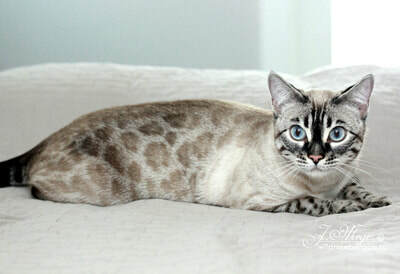 Doughnut rosette markings should be large open spots that are filled with color that is darker than the background color and outlined in an even darker color. 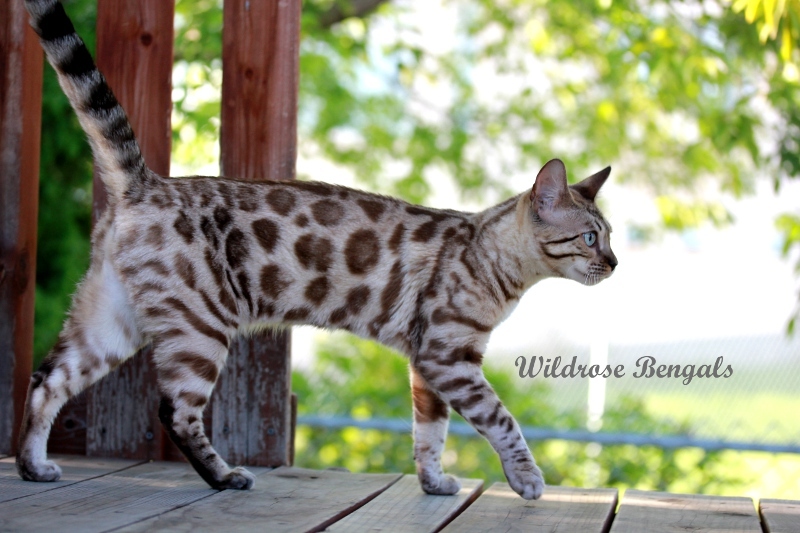 Kyzer has mostly donut rosettes with a few arrowhead rosettes along his spine. 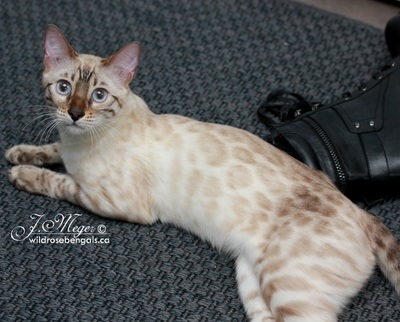 Paw print rosette markings should be dark spots around a larger shaded spot filled with color. 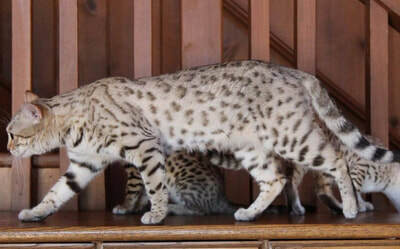 These are examples of sheet marble Bengals (SLP right, Brown below). Marble bengals should have a very flowing and random pattern. Their pattern continues to change until they are about 2 years old. 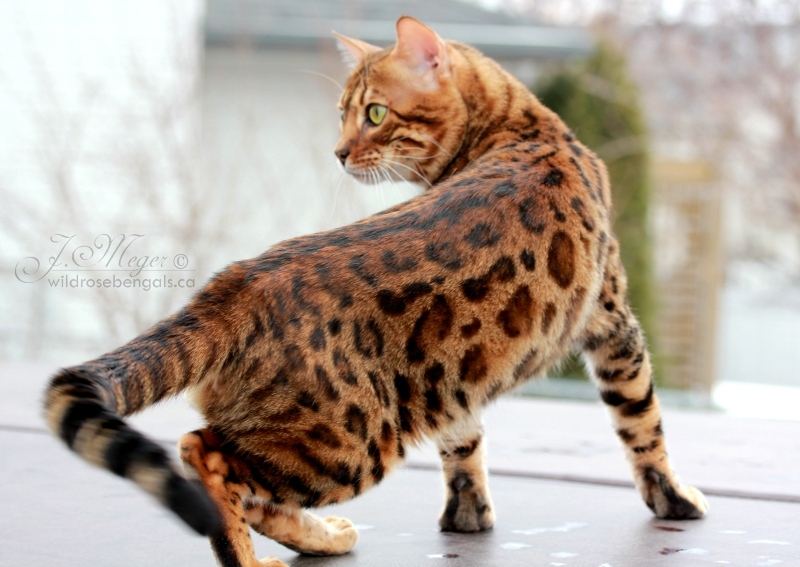 There are many different coat colors that Bengals come in, brown being the most common. 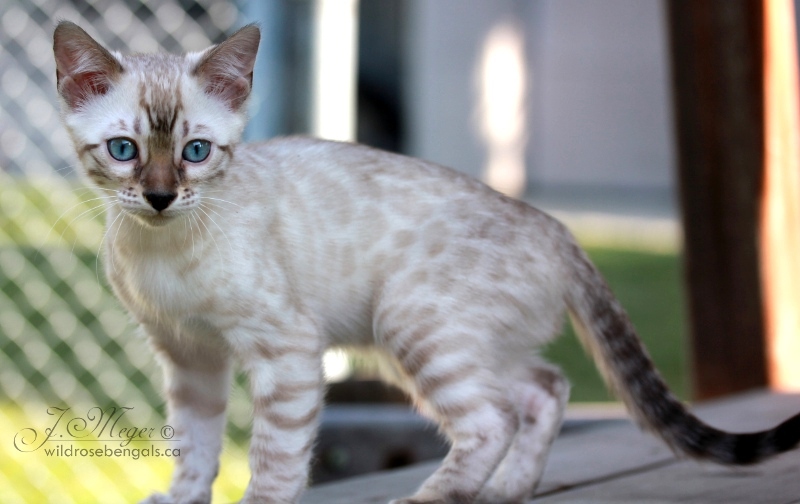 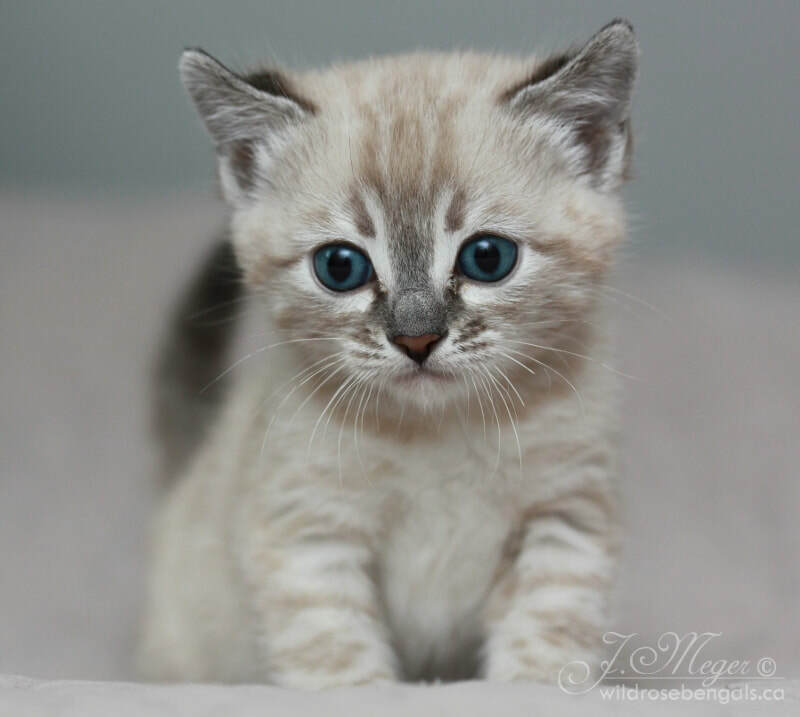 Other colors include Silver, Snow (Lynx point, Mink & Sepia), Charcoal, Blue(dilute) and Melanistic (Solid). 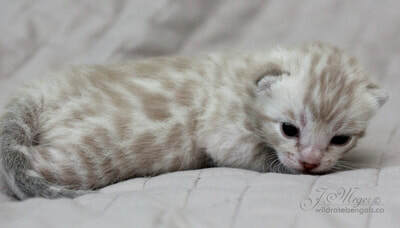 Some can even be a combination of a few different colors. We will cover the colors that we are producing here at Wildrose Bengals. 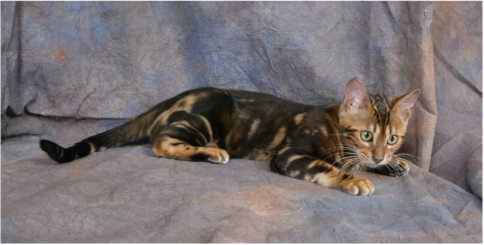 Brown Bengals come in a huge range of color tones, ranging from a very cool brown (looking almost grey) to such a warm brown it is almost orange. They can have light brown to black rosettes. 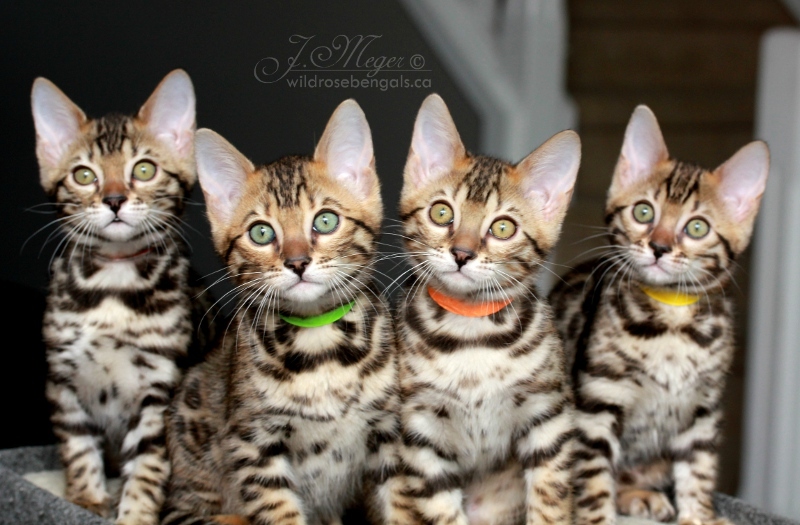 Their eye color can be green, gold, or a mixture of the two. Snow Bengals are divided into three different colors, Seal Lynx, Mink, and Sepia. Seal Lynx Point (SLP) is the lightest, they are most often born completely white and their pattern develops as they get older. As adults they can have a background color that is white to cream colored and pale to medium colored rosettes. They typically have darker markings at the points (head, feet, tail) and darken in cooler climates. Seal Lynx have blue eyes. 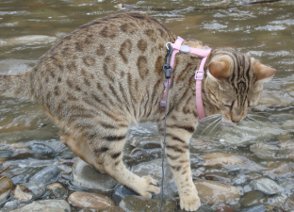 Mink are born with a visible pattern. 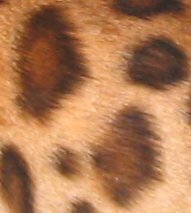 As adults they can have a light cream to light tan background color with light to medium tan colored rosettes. Mink Bengals have Aqua colored eyes. 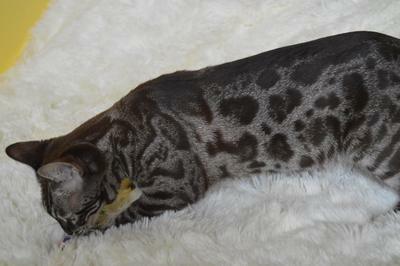 Below are some pictures of our mink girl Latte from newborn to almost 4 years old, she is quite dark for a mink. 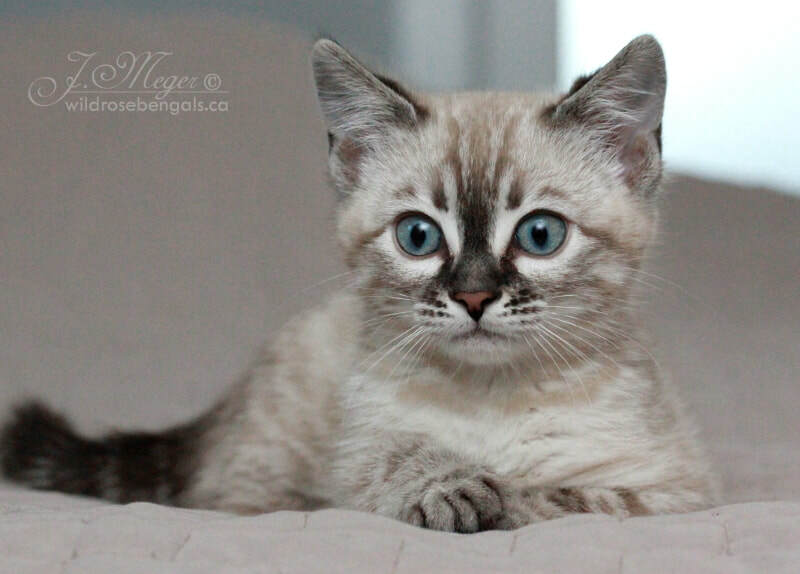 (First two Photos courtesy of BoydsBengals) The second set of photos is of our boy Jasper, from 1.5 weeks old to 7 months old. Sepia look similar to mink at a young age, but as adults most closely resemble brown Bengals except that the background and marking color is usually slightly lighter, although some can look more like Mink. 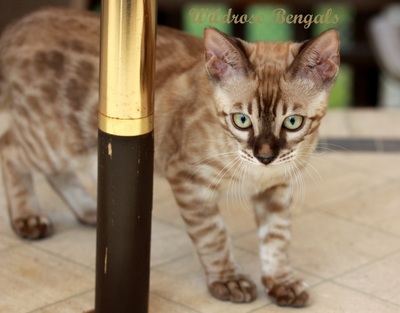 Sepia Bengals have green to gold colored eyes. We will have Sepia colored Bengals in 2019! Every Bengal color can come in Silver. 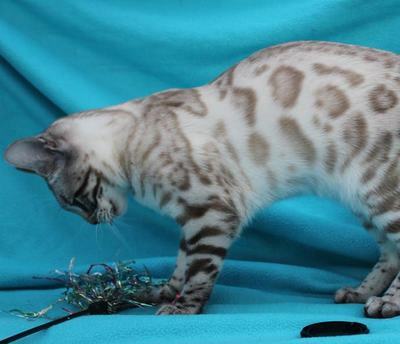 Silver is sometimes difficult to determine as they can look like cool brown cats if there is tarnish. 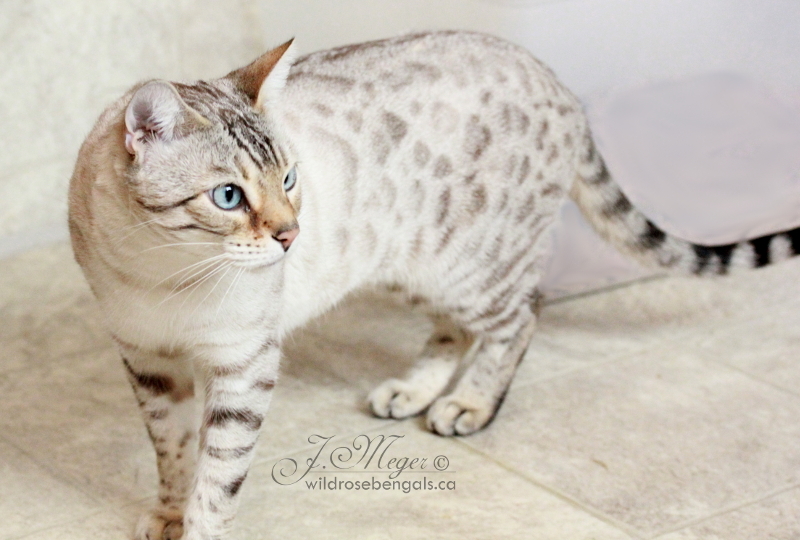 Silver snows (especially SLP) do not look much different than the non-silver variety. There is currently no color test for silver. 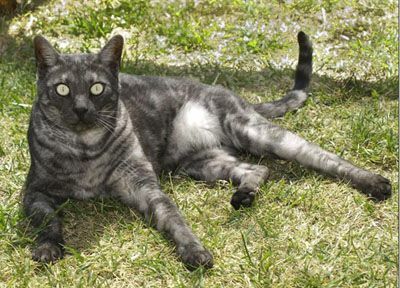 Silver Mink - Silver Mink look very similar to regular Mink and are often difficult to distinguish as young kittens. 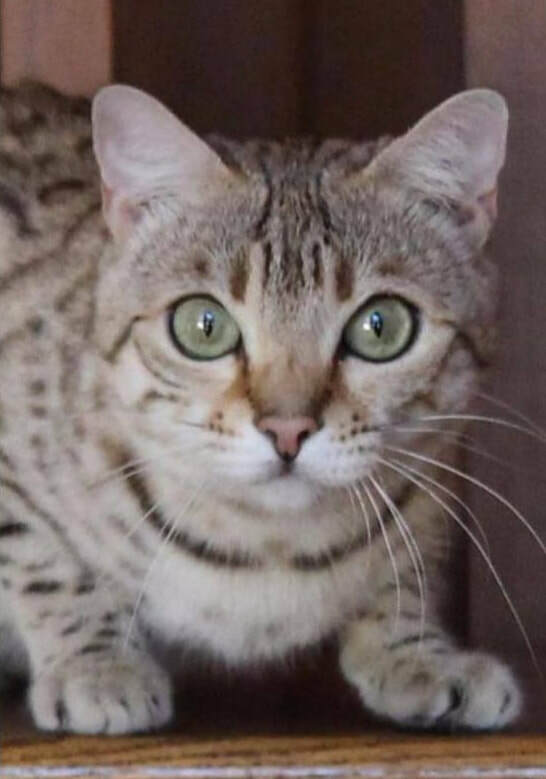 As adults you can see the face and legs have more silver coloring. 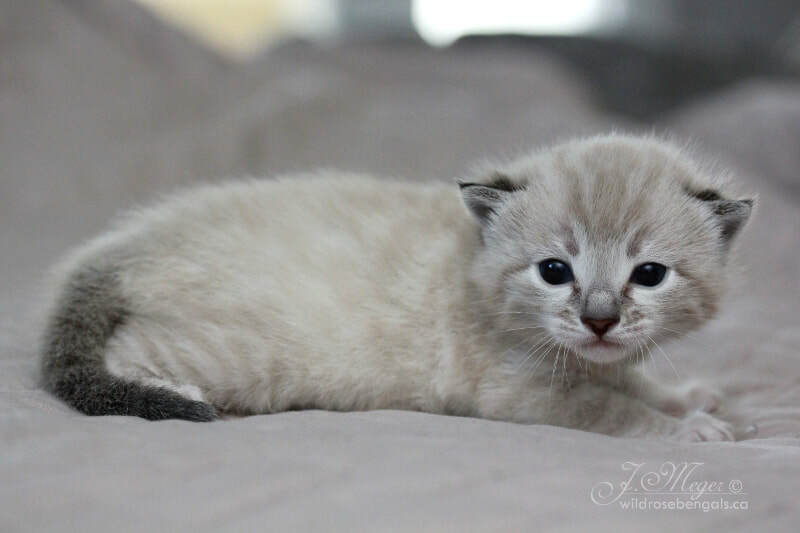 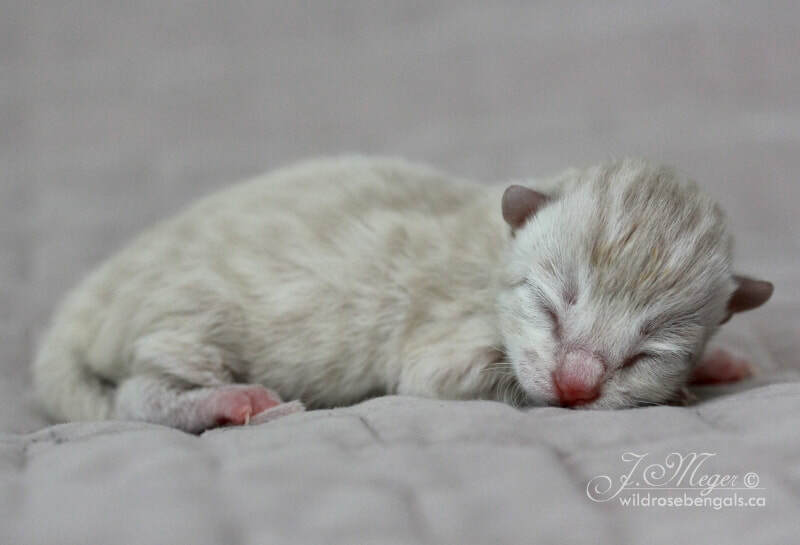 I could not find any good photos of Silver Mink kittens, but will post some when we have some kittens! 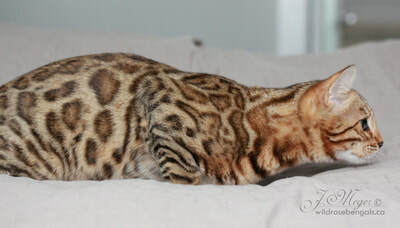 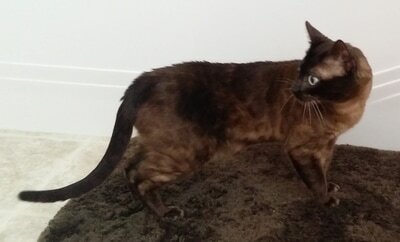 Solid Bengals (also commonly called Melanistic)and have very muted markings. Here are some of the colors available in solid. 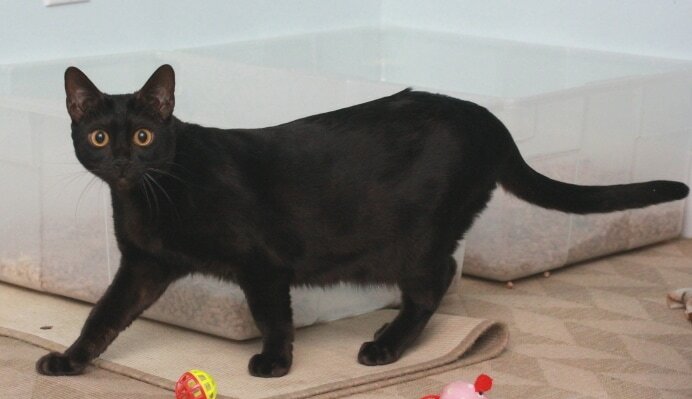 (1) Melanistic (Solid Brown)- Melanistic are essentially a black cat. As a kitten the markings are visible, but as an adult most times you are not able to see the markings. 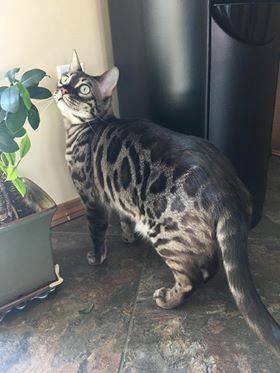 Sometimes in certain lighting you can see ghost markings like a black panther has.